A new paper from SPPI & Christopher Monckton demonstrates how the IPCC et al hides the halt in global warming over the past 20 years by using decadal averages instead of showing the monthly satellite data, "a meme that has become a favorite with the apologists for Apocalypse: the most recent decade was warmer than earlier decades, so global warming is still getting worse." In addition, Monckton shows how the temperature record has been repeatedly "adjusted" to cool the past and warm the present, another statistical fraud of the global warming scam. "The effect of all these tamperings is to make it look as though there was more global warming in the 20th century than there was … So this statistical dodge neatly erases the past 12 years 8 months of the Pause. The priceless advantage of taking decadal averages, if one wants to magic the Pause away, is that it wipes out the entire trend of the most recent decade. One can dock off a further two years if, as here, one uses the decades 1991-2000, 2001-2010 etc., rather than 1993-2002, 2003-2012 etc. Finally, using decades docks off all the months of the current year. So this statistical dodge neatly erases the past 12 years 8 months of the Pause." In the 19th century, British Prime Ministers used to say there were “lies, damned lies, and statistics”. 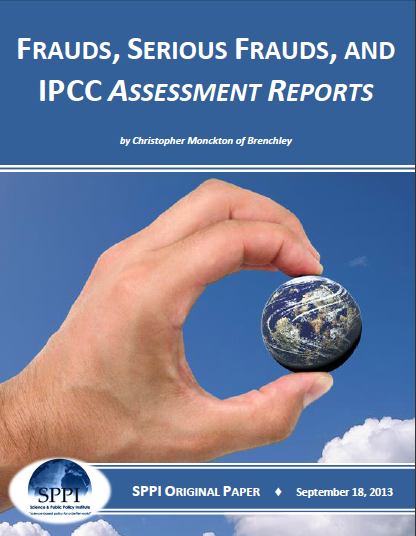 In the 21st century, we may say there are frauds, serious frauds, and IPCC Assessment Reports. Recall, for instance, the notorious graph in the Fourth Assessment Report that falsely indicated that the rate of global warming is accelerating and we are to blame. Using the same statistical dodge, one can show that a sine-wave has a rising trend. There is no statistically significant warming for the past 20 years. Note the tiny differences in decadal average temperatures over a variety of starting points. Climate is the 30 year average of weather. What do the 30 year rolling averages of those data sets say? Or are you trying to disprove climate change by comparing it with weather? Climate is indeed an average of weather. Your claim that it is a 30 year average is an arbitrary & capricious, plucked out of thin air number. Three published papers have said a "pause" of 17 years or more falsifies AGW, and the "pause" is now almost 19 years old.